Amazon is entering the smartphone game with their brand new “Fire Phone” . 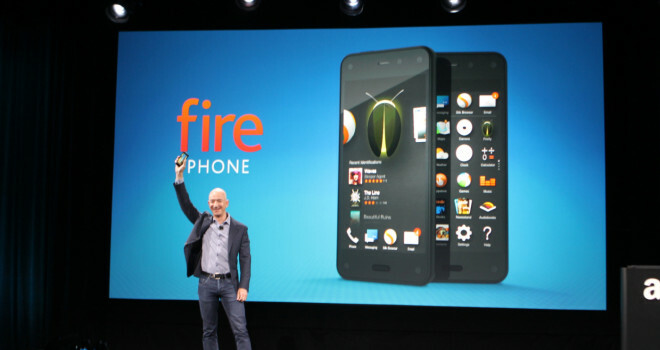 The Amazon Fire Phone will be sold through AT&T. A 32GB version will sell for $200, while a 64GB version will be available for $300. The phones ship July 25. The Fire Phone runs on a version of Android and confirmed apps so far include HBO, Netflix, ESPN, YouTube, and Showtime Anytime. CNET reports that Amazon Prime members will have unlimited storage for photos. The phone also features a special 3D interface called Dynamic perspective, which changes as you move the phone and your perspective relative to it. Amazon’s Fire Phone also has a new service called Firefly, which is a visual recognition program that can see objects, QR codes, URLs, and bar codes. If you walk by a sign featuring a phone number, Firefly will recognize this and automatically call the number if you want. Firefly can even recognize music and audio from TV shows and movies. The Fire Phone has a 4.7-inch HD display, aluminum buttons, a Qualcomm Snapdragon 800 processor, Adreno 330 graphics, 2GB of RAM, and a 13-megapixel camera which features a f/2.0 five element lens and optical image stabilization. It also includes a “Mayday” button, allowing you to get Amazon customer service 24x7x365 if you need help in any way. Amazon’s Fire Phone looks like it will be a contender against rivals like the Apple iPhone 5s, and Samsung Galaxy S5.